Why not try growing apples at home? Eve was most certainly right about apples! They are the most fabulous and tasty fruit - certainly good enough to offer as a gift to your man or anyone else. Here are some details of how to select and care for apple trees so that you can enjoy wonderful home-grown apples. The wonderful thing about growing apples at home is that even with quite a bit of neglect and even incompetence, you are still likely to get a crop! Now, I'm not advocating neglect and incompetence, of course. But it is quite easy for the days to slip past and the period for pruning to be over and gone. 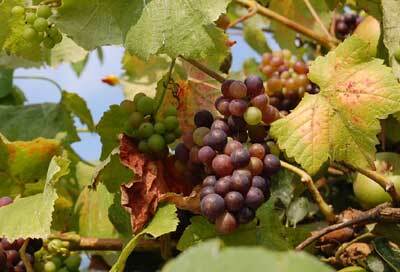 And it's quite easy to fail to find time to check for rust or other problems to ensure a heavy crop of quality fruit. Nevertheless, with a little luck you will still get a seasonal bonus of wonderful fresh fruit which can be eaten, stored, juiced or made into easy apple recipes such as delicious pies and preserves. And when you bite into a fresh, juicy home-grown apple, you know that it really is fresh. Some supermarket apples may be a year or more old! They sit in cold storage slowly declining in taste and vitamins. There's no way they can compare with a good home-grown fruit. Growing apples is surprisingly easy though there's a lot to know if you want consistent, high quality fruits. 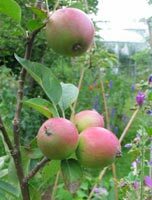 See below (bottom of page) for good reading on growing apples and caring for apple trees. Here's the Greenfootsteps guide to easy apple growing at home. Have you got room to grow apples? The good news is that you can grow apples in the smallest back yard or garden. There are even varieties available in plant nurseries which can thrive on a patio or a balcony. So, unless you are completely without outdoor space, the likelihood is that you do have room for an apple tree or two. Of course if you have room for standard trees (old fashioned orchard-sized) you will have somewhere to hang your hammock eventually, too! When selecting apple trees for your garden or orchard it is essential to think about the final height that you want and the space that the tree will need in order to thrive. See below for a brief guide to selecting the right rootstocks. Is the soil good enough for growing apples? Most types of soil can accommodate an apple tree. The best soil is a clay/loam but other types can be improved with the addition of humus, mulch and compost. The apples shown in the picture below have had no special treatment other than a little added compost from time to time. The soil is light and sandy and dries out easily. This is important. You need to think very carefully about the maximum size your tree will grow to. There are several types available for the small garden. The size of the full grown apple tree is determined by the type of rootstock you buy and also by growing conditions. Confusingly, the same type of apple tree can be bought in different sizes. This is because apple trees are propagated by grafting and budding. This means that a rootstock (root and stem) from one tree type has another type added onto it. The bottom part of the tree - the root and lower stem are from one plant and the top - the rest of the trunk and branches - are from another. The top part of the plant provides the apple variety and the bottom part determines the end size. This grafting of two trees seems at first sight a strange and curious thing to do! Even more amazing is that it works at all. Nevertheless, there are some good reasons behind the practice. 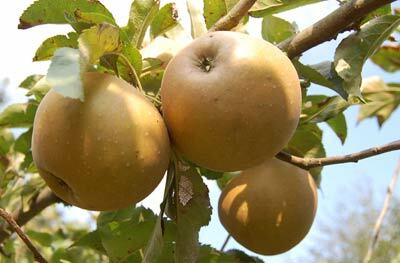 Most commercial apples are produced from grafted trees. Most - if not all - apples found for sale in garden centres are from grafted trees. The technique works well to produce trees of predictable quality and size. Grafting is is done because apples do not grow true from pips. If you plant a pip from a Cox's Orange Pippin, for example, you will almost certainly not get a Cox's Orange apple tree. In fact, you might grow a tree which produces no usable fruit at all. If you want to be sure of getting a Cox's Orange Pippin every single time you need to employ grafting or budding techniques. The other reason that growers use grafts and budding to produce new trees is that they can control the vigour of the rootstock and determine the size and vigour of the full grown tree. The plants ability to resist disease also varies with the rootstock and - to make things even more complicated - some rootstocks do better in particular soil types. Grafting technology gives growers the assurance that their plants will bear identifiable, consistent fruits. When you buy a Cox's Orange apple tree from a nursery you are basically buying the same tree as produces your supermarket Cox, even if it's been imported from the other side of the world. Is it worth growing apples from pips? No - not if you are keen to get some worthwhile fruit for your efforts. But that's not to say that you can't take a punt and try growing your own apple tree from seed. Wild or feral apple trees will have started life this way - from a cast aside apple core or from seeds brought to the site by birds. Many of these trees produce wonderful fruit for juicing - but it's rarely good enough to be worth the trouble of propagating. We have several feral apple trees near us and although the fruit is tasty, the skin is tough and the fruits are small and knobbly. For most of us, growing apples which are dependably good does mean selecting carefully from the types available in nurseries. So, to return to selecting a good apple tree, the important thing is to study the rootstock types. Here are the main ones you will find in nurseries and garden centres. They all sound like British motorways and there does not seem to be much rhyme or reason for the lettering (the system is actually based on the East Malling Research Centre which developed them in the last century). The sizes generally increase as you read from top to bottom. I've left out the standard sized trees, M1 and M25 (more famous motorways!) They will be too large for the average garden. However if you have enough space, standard sized trees are more vigorous and will probably outlive you! You can prune them to curtail growth but this will mean annual attention at the very least. Some types have different properties such as disease resistance to a particular disease or suitability for a particular soil. For this reason it is worth talking to a nurseryman (or woman) about your soil type and aspect before growing apples. What size apple tree to choose? For a small or medium garden you will want to buy apple trees which are from dwarfing or semi-dwarfing stock. MM106 and M26 are good sizes. The trees from these rootstocks can be grown to different shapes but they will remain relatively small. If you have masses of room and enjoy large trees it can be lovely to have a standard tree. Remember, if you want unbruised fruit you will need to get up on a ladder to pick it. You also need to ensure that your apple tree will not interfere with any overhead power lines. If you need to limit your apple growing ambitions to a patio or garden then you need to buy special varieties such as "Ballerina" which are suitable for growing in a pot. Despite their slim profile Ballerinas can crop reasonably well. If you want to be clever and incorporate your apple trees into a border you might consider cordons, step-overs and espaliers. These all require rigorous training from the beginning and are therefore relatively expensive to buy. If you are just growing apples for a good home supply of fruit the probably easiest size and shape to work with is a dwarfing stock pyramid or bush shape. In the UK you can buy apple trees by post from several outlets. Many garden centres and horticultural businesses stock them. (2) Growing Apple Trees is about pollination and how to plant effectively. Here are some great books on apple growing. This book is written by an organic grower with years of experience. He also helps the organic growers network to grow from his farm in New Hampshire. This book and his others get rave reviews on Amazon. The Best Apples to Buy and Grow is an authorative work if you want to get serious about selecting and growing good apple trees. The Story of The Apple is a highly readable account of how apple trees have devloped and been used by us from Adam and Eve to Johnny Appleseed and beyond. Fascinating! More excellent books on growing fruit are available from Amazon. You can see some displayed on the side panel.